Premium Twilight Phang Nga James Bond. Catamarans are an amazing and very comfortable way to travel around the islands. This is one of our premium trips, so if you don’t mind paying that little bit extra, it is worth while just to have the amount of space and comfort to walk around on the boat, take pictures, relax and eat. You will visit Phang Nga Bay, Lawa Island where you can have a nice swim and relax on the beach or have a look around if you wish. Next stop is Hong island and you can do some canoeing some really amazing natural beauty. You will also visit the famous James Bond island and Panak island. 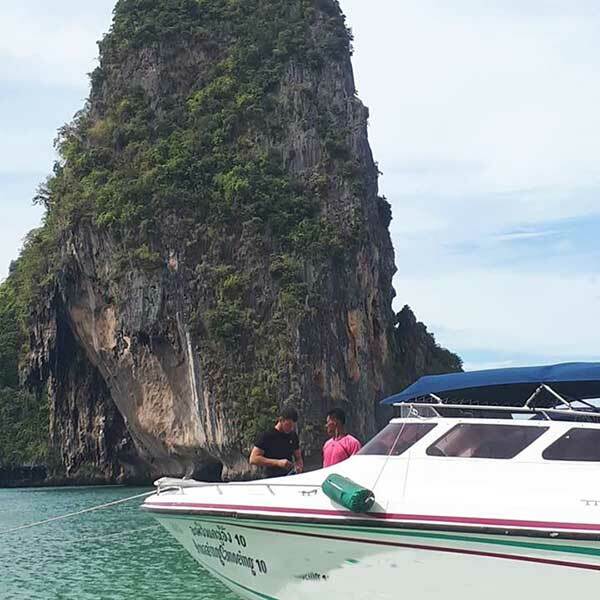 Join us on our Premium Twilight Phang Nga James Bond trip if you wish to avoid the crowds and have a beautiful leisurely day out. Start to pickup from your hotel around Phuket and transfer to “Pier 88 Terminal” located in “Ao Por Grand Marina” where you will get registration and equipment here. 13.00 Arrive at Pier 88 Terminal for registration and equipment receipt. Our tour guide will service you in registering and providing the snorkeling gear before leaving to Ao Por Grand Marina it take only 5 minutes to get there. 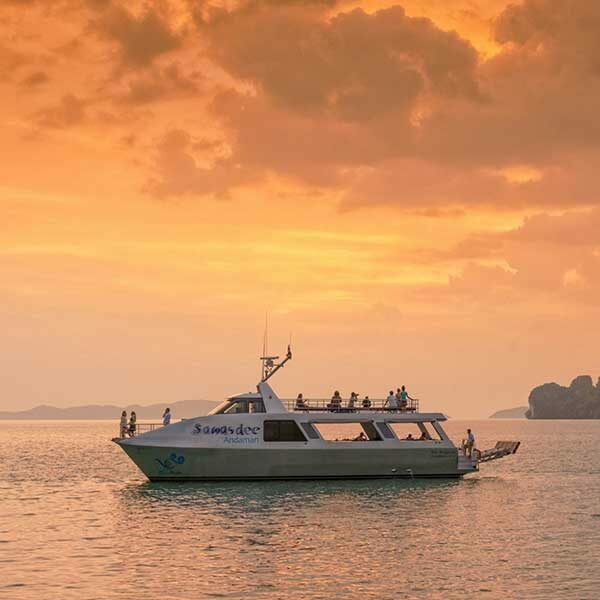 13.30 Depart from Ao Por Grand Marina to “Phang Nga Bay” and commence our Premium Twilight Phang Nga James Bond Tour. 13.45 Arrive at “Lawa Island” for swimming and relaxing on the beach. The little heaven in Phang Nga Bay as it is the one and only white sandy beach as well as the clearest blue sea in the bay. 15.00 Depart to “Hong Island”, The access to it by canoe will get you closely touching to the circle shape of limestone cliff. Enjoy scenic view by a sit on top inflatable canoe with a guide who will do all paddling. 16.00 Head towards “James Bond Island”, The most famous destination in Phang Nga Bay. Take a short walk to explore its surrounding select your best spot for photo shooting with “Khao Tapu” and “Khao Pingkan”. Move on to “Panak Island”, The Highlight of the program. When it is back to its tranquil stage, its dramatic scenery of steep limestone karsts will be double as much its magnificence besides, It will be spectacular triple as much when it become the twilight. The bay will shine its chaming ray. Admire twilight atmosphere from the upper deck of our Catamaran while refreshment will be served. 18.00 Head back to Ao Por Grand Marina for Pier 88 Terminal for dinner. 18.20 Arrive Pier 88 Terminal , The dinner venue Buffet dinner is will prepared to serve you here. 20.00 End the trip and transfer you back to your hotel. This is an amazing tour to check out if you are looking to see as many of Bangkok’s landmarks as you can. This tour takes you to the Royal Grand Palace & Emerald Buddha, as well as all of the most famous temples, don’t miss this Tour when you are in Bangkok. Half day morning Khai Island. This is a whirlwind half day morning trip to the 3 Khai islands, snorkeling at each location and a great morning out on a speed boat.